Having run five previous marathons, I knew how to run a marathon and what to expect from a United States marathon, but Berlin was my first outside America. The biggest difference in preparing was knowing that the race was referred to as 42.195 km instead of 26.2 miles. Other than that, I didn’t know what differences to expect. The race began near the historic Brandenburg Gate and headed away towards the roundabout around the Tiergarten and turning right towards the historic streets of Berlin. This is where the race’s problem started. Since Berlin is such an old city, the streets are rather narrow and the world’s fastest race also became the most crowded. I was behind my planned pace of 10 minute miles initially as I was forced to contend with the crowded streets but not over exert myself dodging people. With time and some sidewalks I was able to get up to my desired speed as we headed east on Alt-Moabit. I was feeling good and worked hard to keep my 10 minute per mile pace as we crossed the canals and reached kilometer 8. A turn left to head north to Oranienburger Tor and further east gave a scenic view of classic Berlin. Heading south took us on a bit of a zig zag. It was also around kilometer 13 where we hit an unexpected hill. While it wasn’t a large hill in relation to most courses I’ve run, it was a quick hit to my run, but the downhill came up quickly after to even out the times. Kilometer 17 turned back west and it was a straight run to the halfway point. Just past the half marathon point, one of the musicians finished singing with her band and announced to us that Dennis Kimetto had broken the world record with a time of 2:02:57. Each of us looked down at our watches at the announcement and realized we were all about 10 minutes over that time already. Jokes were tossed around between the runners as we continued on and kept spirits up. I decided that since the roads were more open than earlier and I was still feeling good, I would push myself a little harder and dropped by pace down to 9:30 per mile. Moving further west before heading south and further west as we moved towards the newer parts of the city and the major shopping areas. Thankfully the roads were wider for the second half of the marathon, which led to less crowded areas, except at the water stations. Between the narrower areas, the people walking everywhere, and the mounds of plastic cups that piled up forcing everyone into narrow lanes. Just past kilometer 29, it was a right turn to head north and begin the approach back towards Brandenburg Gate. East by northeast the course turned and I attempted to push down to a 9 minute mile, but had trouble maintaining it. I began to feel a little dehydrated and had a little pain in my legs. I eased back a bit but kept pushing. I knew I had been running strong and was definitely getting the PR I had planned for, but didn’t want to lose it. As I passed the last water station, I looked at my watch and saw that if I pushed my last mile, I could achieve a 4:20 finish, a full 10 minutes above my initial goal time of 4:30. By dropping back down to average nine minutes on my final approach to the finish line, I got to the finish line at 4:20:39. 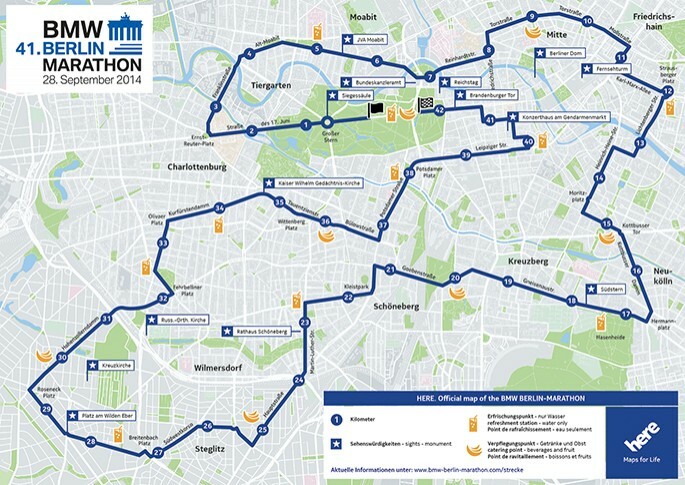 The Berlin Marathon is the fastest, flattest, and most crowded marathon course in the world. Kimetto was able to break the world record in an inspiring run, and I was able to break my personal record on the same day. I am also now halfway through the six World Marathon Majors, which I hope to one day complete in London, Boston, and Tokyo. Until then, I am a month away from my seventh marathon in NYC.